Exploring the deep blue sea is one of the most exciting things a person can do! You allow yourself a window into the more unknown aspects of our world, enabling yourself to see weird and wonderful creatures, as well as the general beauty of nature. There are several ways to pay a visit to the underwater world, two of them being scuba diving and snorkelling. Scuba Diving and Snorkelling may seem quite similar, but it’s important to understand the aspects that distinguish the two exercises. Though they both have the thrill of underwater exploration in common. Firstly, what do they have in common? Both require the participant to wear a mask in order to take part. Both require some sort of snorkel. Both are a lot easier when wearing fins and objects that help you to paddle through and on the water. Both can be participated in by anyone willing to have a go. 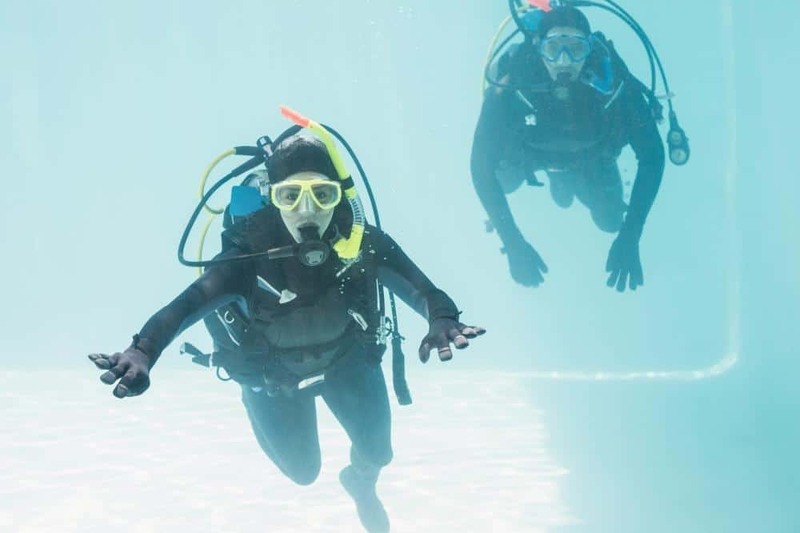 Both exercises allow the participant to have underwater experiences. Both allow the participant a certain amount of exploration. So, as you can see, the two do share some similarities. It’s important to understand these, because now we are going to focus on what each individual exercise. Through this we will be able to determine what makes them different. 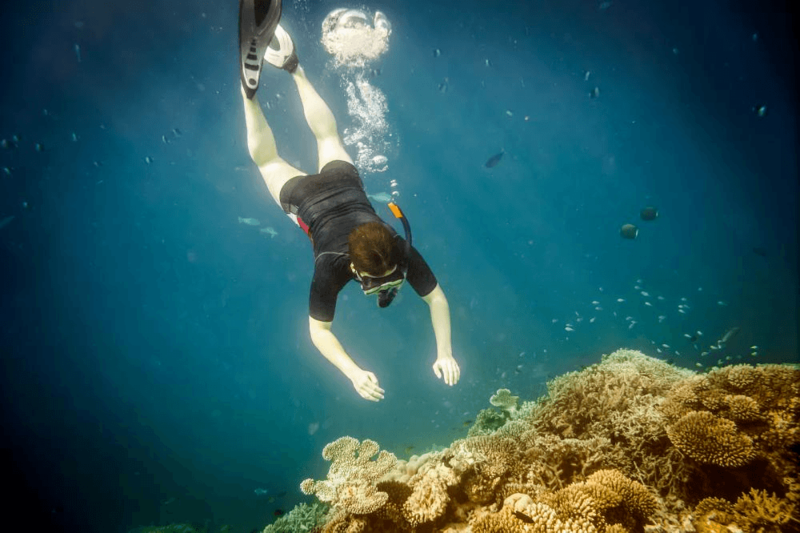 So, what is the difference between Snorkelling and Scuba Diving? Snorkelling is an experience that many take part in. It is when a person swims on or through a body of water with a diving mask on, a snorkel and often swim fins as well. When snorkelers are exploring colder bodies of water, they would also where a wetsuit too, in order to keep their body heat up. Where is it usually done? Well, it is popular in hot and beach-centric holiday destinations. This popularity is based on the fact that Snorkelling doesn’t involve a lot of complicated equipment. It allows holiday-goers and experienced snorkelers alike a chance to see underwater and explore what is down there. Snorkelling is quite easy, however we have broken it down into simple stages to help! Find a snorkel that fits you comfortably and attach to head, making sure the mask is sealed around your eyes and nose. Attach fins to your feet in order to move comfortable through the water. Find a body of water deep enough to allow you to swim and observe under the water. Lay in the water on your stomach. Slowly push your head under, making sure the snorkel is working and no water is seeping into the mask. Tighten your mouth around the mouthpiece of the snorkel to hold in place, whilst checking that you are able to breathe clearly. When you are sure you are breathing easily, take a moment to assess the underwater surroundings. Pick a spot that looks interesting and go and discover what lies beneath. This is a beginning guide. Once you get a bit more comfortable with clearing your airways, you’ll be able to submerge yourself in the water in order to see the underwater world up close. Now that we’ve covered Snorkelling, let’s talk about scuba diving, then we will be able to see the difference between Scuba Diving and Snorkelling. Scuba Diving is a form of underwater diving in which the participant submerges themselves in a body of water with the help of self-contained breathing apparatus designed to enable underwater breathing. This breathing apparatus is usually centred around the use of compressed air, and being that there isn’t any form of surface supply, it allows the diver complete independence and freedom. Other equipment needed is a snorkel-esque mask to allow breathing of compressed air and improved vision. As well as swim fins to enable the diver to move easily through the water. Scuba Diving is done both recreationally and professionally. Recreational Scuba Diving mainly happens in hot places. However, it is also used for scientific exploration, meaning it can be done in almost any body of water. How do you scuba dive? Scuba Diving is a bit more of a commitment than snorkelling, so it should only really be done with a professional at the very start. Even so, here are a few tips on how to prepare for a scuba dive. Select a suitable location. The depth, visibility and temperature are all very important pieces of information that you should know before diving. Do your homework. It’s better to know how the equipment you’re using actually works. Because if it malfunctions, you’ll be able to take pragmatic steps towards fixing it. Prepare gear that fits you and is in suitable condition. The last thing you want to contend with is shoddy face mask or low quality breathing tube. Find out how you will enter the water. The two main ways of entering the water are from a boat or from simply walking into the water via the beach. Now that we’ve explained the intricacies of both exercises, how exactly are they different from each other. One of the first things that should be apparent is that scuba diving requires a bit more training and commitment before you’re able to get the most out of it. This is because it involves diving to certain depths with high-tech equipment. You need to have experienced scuba diving a couple of times before you can really experience it fully. Snorkelling on the other hand is something that can be picked up quite naturally. It’s safer as you always stay quite close to the surface and don’t stray too far down unless you want to. Although you can go completely underwater in both snorkelling and scuba diving, it is scuba diving that requires participants to really push themselves further and further into the depths of the body of water. This is the case as you have breathing apparatus that allows you to freely breath underwater, what good would it be if you didn’t use it? When you get more experienced in snorkelling you can also go underwater, but you will always have to come back for air. One’s just for fun really. Though snorkelling is sometimes used by Marine Biologists to get an insight into a sea bed or part of the water, Scuba Diving is the one that is primarily used for scientific gain. This is because it can help us reach sea-life we wouldn’t normally be able to for longer amounts of time. It also comes in handy when excavating shipwrecks as well. One of the most important differences is that Scuba Diving is quite a bit more dangerous than Snorkelling. When snorkelling, you are always quite near the surface of the water, whereas Scuba Diving requires you to go quite deep under the water’s surface. So there are a few more dangers to be aware of when scuba diving. Now that we have told you the difference between Scuba Diving and Snorkelling, we wish you good luck and hope you have lots of fun doing either!. Can you Scuba Dive While Pregnant?